This curious set of platforms appear to be an SE&CR creation, probably dating from 1908, when the company opened a number of wooden halts along its network. Situated just beyond the western portal of Shakespeare Tunnel, its raison d'être was to provide an alighting point for workers of the adjacent Dover (or, ''Shakespeare'') Colliery. This coal extracting operation was begun in 1896, in the wake of the SER's Channel Tunnel construction attempt. The latter had received Royal Assent in 1881, and although boring subsequently began the following year, the project fell foul to the Government's concern that the tunnel could provide an easy route for invaders from the Continent. Compounding this, the finance for the initiative was also lacking, which put paid to a tunnel under the Channel. Nevertheless, the SER's endeavours had not been totally fruitless, and during the short-lived excavation, coal was discovered. This then gave rise to the aforementioned colliery which, after sinking a trio of shafts, experienced instant problems with flooding - it was seven years until the first significant coal deposits were removed. Although the colliery closed for good in 1915, the halt was retained for rail staff who lived in the nearby railway cottages - the occupants could come by train or, instead, go by foot by utilising a flight of stairs cut out of the chalk cliff face. The stairs were flanked by banisters composed of rail which had formerly been part of the SER's small narrow gauge network at the site, during the short-lived Channel Tunnel project. Shakespeare Halt was also conveniently-positioned for Abbotscliff signal box and siding, these being located just to the west. What the diminutive set of platforms have been used by frequently in the past, however, are railway workers arriving to deal with the frequent landslips along this stretch of line. The most significant of these occurred in December 1915, which saw the route closed beyond the end of the First World War, until August 1919, forcing crucial military traffic to access Dover Marine station by the ''Chatham'' route, via Faversham and the Priory station. The tracks had been pushed 53 yards closer to the English Channel because of the slip! More bad fortune saw another major landslip occur during World War II, in November 1939, but the line was, comparatively, brought into use swiftly, opening again in January of the following year. 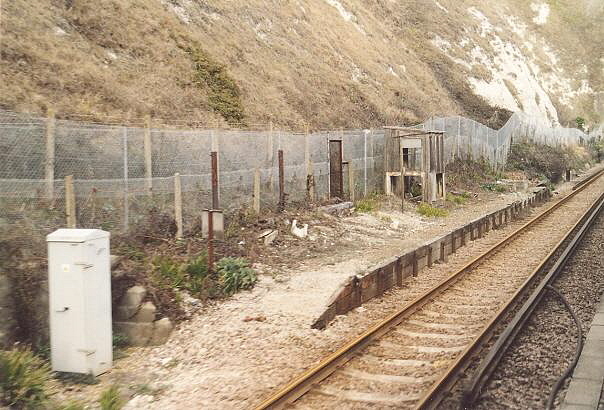 The halt is one of two which still exists along this line; the second came after the closure of Folkestone East (Junction) station on 6th September 1965. 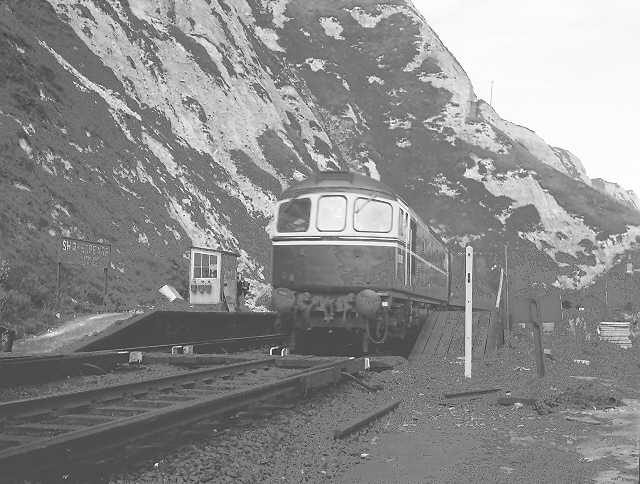 A section of platform, for staff use, was retained in front of the 1962-installed ''power box'', serving the rolling stock sidings which were still in use beside the junction with the Folkestone Harbour branch. A third, which officially closed in 1939, was that of ''Folkestone Warren Halt'', which had originally opened to the general public in 1886. It was an SER innovation to attract the public to the dramatic scenery of the area, but with the company receiving legal threats from local landowner Lord Radnor, claiming that trespassing was occurring on his land, the halt merely lasted the Summer season. However, it was later brought into use by the SE&CR in 1908, lasting until the landslip of December 1915. Again, all was not lost, and the Southern Railway revived the halt by reopening a set of platforms at the same site in 1923, only for these to be closed too, as a result of the 1939 landslip. Warren has the distinction of costing less to build than the figure quoted in the original estimate.